This week for Shoujo Saturday I’m covering a series that I really enjoyed, even if it was a bit odd. 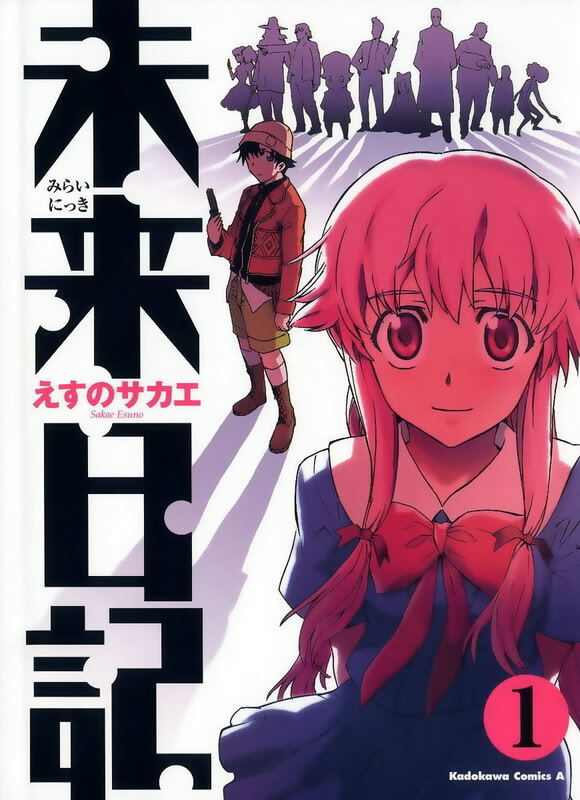 It’s Mirai Nikki, or Future Diary in English, by Sakae Esuno! Plot Synopsis: Yukiteru “Yuki” Amano is a loner who spends most of his time writing a diary on his cell phone or talking with his imaginary friends Deus Ex Machina, the God of Time and Space; and Murmur, Deus’s servant. One day, Deus gives Yuki a special diary, mentioning something about a game. Strangely, Yuki’s new diary has entries in it spanning the next 90 days—entries about the future that come unnervingly true. Plot: The plot of this series is is pretty great, although you may wish to not read it if you have a delicate stomach. I won’t ruin the surprises, but the series is quite good. Characters: Yuno is probably my favorite character, because she’s such a bright and happy character and is a great foil to Yuki who’s a bit of a downer. The rest of the cast is quite good though. Art: The art is amazingly detailed for a romance series, but it fits the series to a T.
Overall: If you want one of the best Romance series this is easily one of them. For those who like: Romance, Action, Drama, Psychological Thrillers, Twists.